Subtitle: I must be nuts. It began as a cloudy rainy Saturday. The crisper overflowed with vegetables we couldn’t possibly eat this weekend. And another kit of home brew (American pale ale) awaited brewing. For a few sane moments, I thought about breaking the tasks into a two-day event. But it was the Siamese love squash that changed my mind. 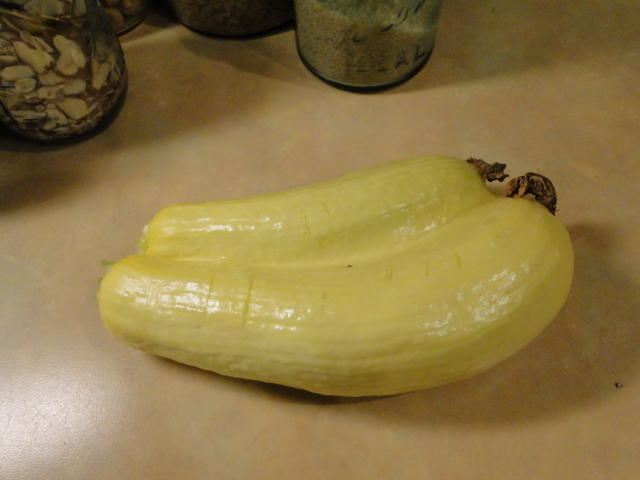 When I found this beautiful double summer squash in the garden this morning, I decided I could do everything and anything. I blanched broccoli and green beans and put up several bags of each. I began making zucchini relish and then decided the beer would be a breeze in the middle of all this. As the beer threatened to boil over, I discovered the zucchini relish made more than I anticipated so I quickly found another jar and did a speedy sterilization process burning my hand in boiling water in the process. My husband came running from the garden to assist, but the wort for the beer was already boiling over. 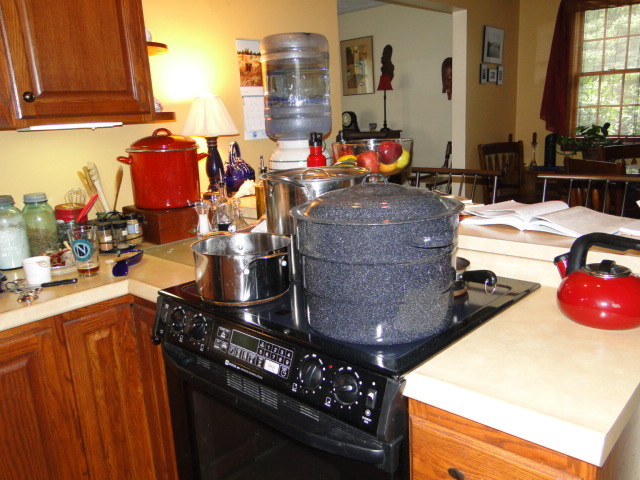 It’s now calm, and I have put up 7 pints of relish, 5 gallons of beer sits cooling in the sink. We’ll put it in the fermenter in fifteen minutes.And I need to start scrubbing the stove top. I am so much in the mood to do nothing! 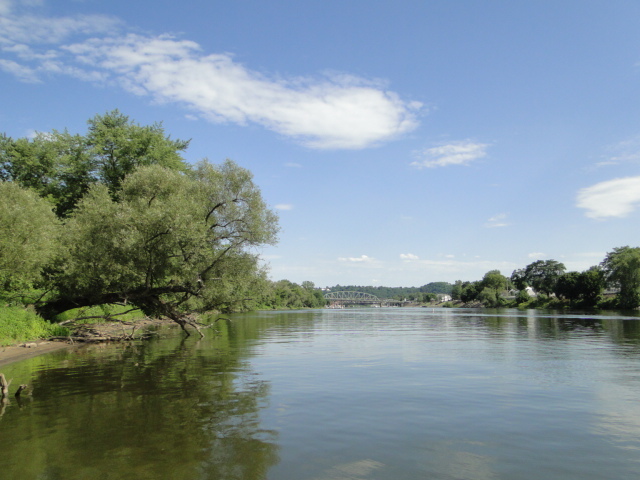 But now it’s time to pack up a picnic and head down to the boat for the evening’s fireworks on the Ohio and Beaver rivers. Here’s hoping I can stay awake for the festivities. 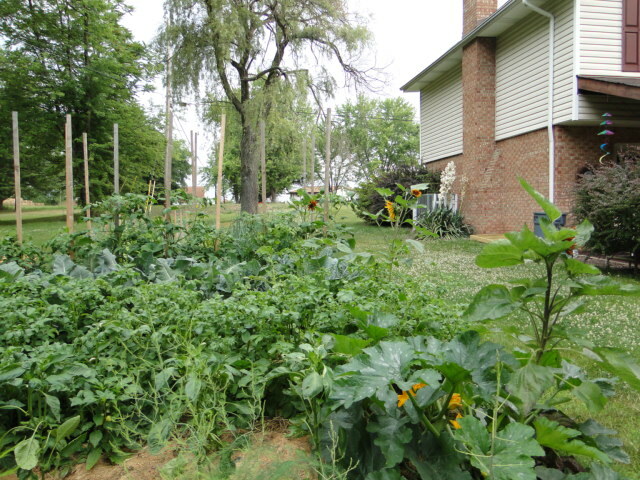 Life in the garden here in Raccoon Township may seem dull until you live it. Live from the Road is free today, Thursday, June 28, until midnight. This promotional day is offered by the Kindle Direct Select program and gives me the chance to broaden the distribution of the e-book. Live from the Road is also available in print for $12.99. How can you go wrong? Here’s your chance to get your kicks on Route 66 for free and from the comfort of your easy chair. So far the book has received eight reviews and all of them are 5-star. I’d love more reviews and “likes” for the book and for my author page on amazon. Enjoy traveling down the Mother Road from Chicago to L.A. Jack Kerouac would be proud. Here’s a nice interview by Rachelle Ayala on her blog Rachelle’s Window about my writing life. Thanks to Rachelle for making me sound interesting! I spent last night in a whirlwind in the kitchen. I decided it was time to use up all the bounty in some way. My husband picked broccoli in the morning because the rabbits have discovered the leaves of the plant and love to munch on them. We had a bag of spinach picked two days earlier waiting for me to do something with them. And the zucchini threatened to overflow the crisper. 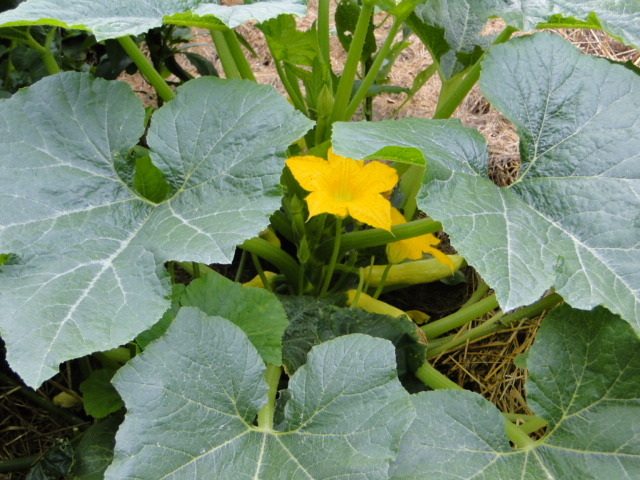 As I worked on preserving and creating dinner, Robert worked in the garden. As I called him into eat, I heard him enter the house. Yes, I’d cleared out the frig of the current produce, but I heard that sound and knew I wasn’t finished. I heard the rustle of a plastic bag as he let the air out of a bag of green beans and then another bag of peas. I haven’t gone into the frig to see what else is there, but rest assured we’ll have another dinner of fresh vegetables tonight. I’m not complaining. 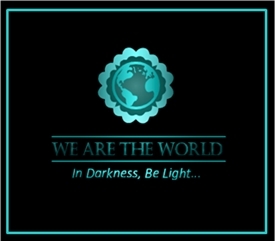 As I worked last night in the kitchen, dirtying dishes and floor, I felt a calmness and peace come over me. I describe it as grace and the feeling of symmetry and participation in nature’s abundant cycle as shredded zucchini flew out of the food processor and into my hair. But enough of my sentimental journey! Here’s the work I accomplished last night. 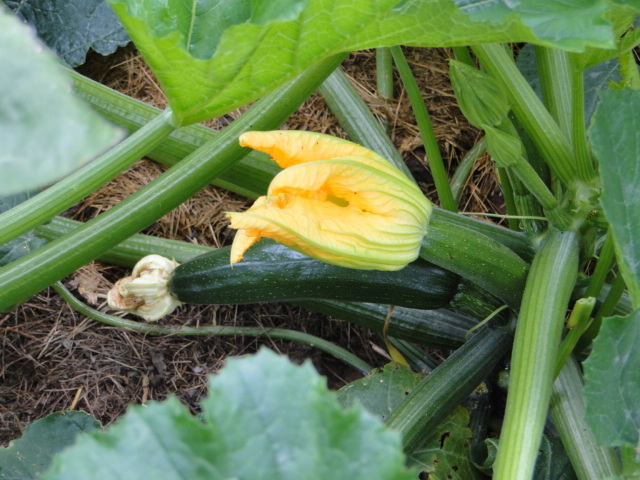 Zucchini – I decided I didn’t have enough to do at least 8 1/2 pints of relish. The recipe I use makes 4 1/2 pints, but I double it. I don’t can food unless I can do a full canner of something; otherwise, I’m wasting a lot of energy and water for very little return. 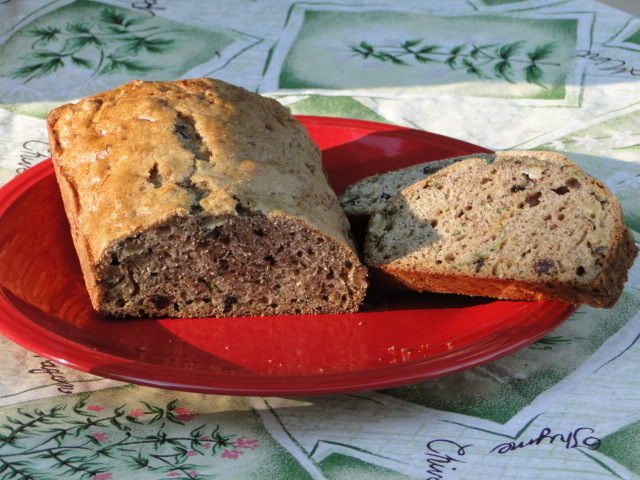 So I made two loaves of zucchini bread. Why do all the recipes call for so much oil and sugar? I usually up the amount of zucchini – it’s a very moist vegetable – and add a little bit of skim milk and cut the oil amount by half. I always use less sugar in everything I make and last night I cut back even more by adding raisins to the bread. I froze one loaf, and we’ll munch on the other for the next week. I had a slice for breakfast, and Robert took a slice for his lunch. Yummy, but I still had about six cups of shredded zucchini leftover so I decided to freeze it in two-cup servings, which is the amount I use to make two loaves of bread. I bought a new preserving book yesterday. 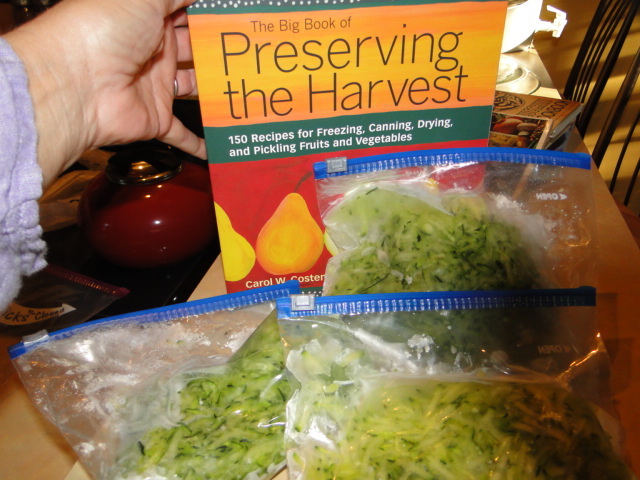 The Big Book of Preserving the Harvest gave me instructions for steam blanching the zucchini. I placed two cups of shredded zucchini in my steamer basket that was in a pot with an inch of boiling water. I steamed for 2-3 minutes and then placed in ice water for another two minutes. I strained in the colander and placed in freezer bags. It was a very quick process and probably the best for retaining vitamins, minerals, texture and color when thawed. Spinach – Then I ventured into dinner recreating a recipe I used to make twenty years ago. This is always risky because I’m using my memory to figure it out. But of course I also have a little knowledge about cooking. I decided to make Greek pizza with the spinach. As I put it together I realized all the vegetables in the pizza came from the garden. That’s not been the case so far this summer, so we are making progress. 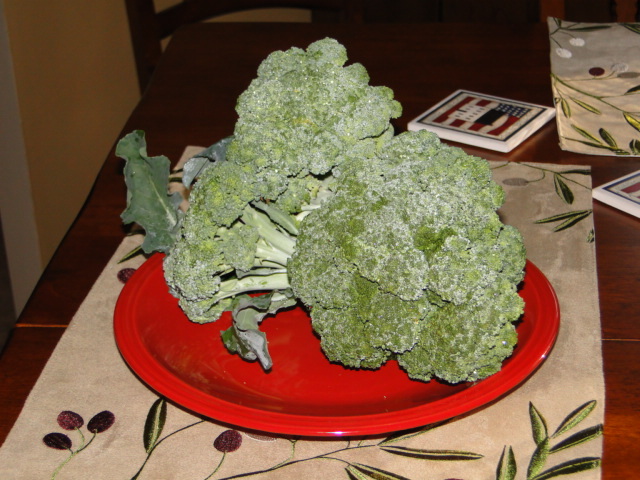 Steamed broccoli provided a side dish. 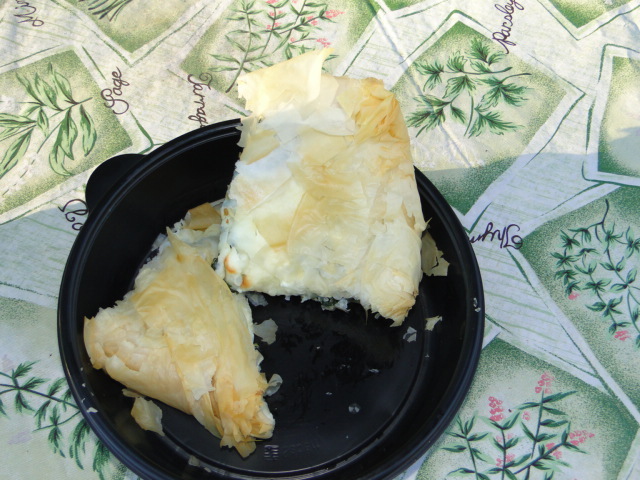 I used phyllo dough sheets for the crust. What hung over the edge of the pizza pan, I folded up over the pizza after all ingredients were in place. I followed the instructions for the dough on the package. I steamed the spinach, and Robert squeezed out as much liquid as possible with a spoon. I sauteed several small onions, four garlic cloves (our first harvest of the season) and basil (picked from the pot I keep on the balcony near the kitchen). The sauteed items went on top of the dough. Then I placed the spinach on top of that. I crumbled about 1/4 lb. of feta cheese on top of spinach and then covered whole thing in approximately 1 1/2 cups of mozzarella cheese. I baked at 350 for 15-20 minutes. It took longer than I thought because I usually bake pizza at a higher temp for a longer time, but with phyllo dough you have to keep temperature a little lower. My memory served me well, if Robert’s comment at dinner is any indication. The crisper is filling faster than we can eat the vegetables, but we don’t have quite enough yet to start preserving, although I think I’ll start grating and freezing zucchini in two-cup portions to use in recipes for bread later today. We’re getting ready to go out on the boat this afternoon so I wanted to make a picnic lunch. We picked about two cups of green beans this morning, so I decided to make an old recipe I originally found in my Moosewood cookbook – I still use two of these, and they are falling apart! But several of the recipes I’ve made into my own over the years, such as this one. I let the old yellowing pages of the paperback cookbooks rest. My portions are not exact, and you can use any combination. I tried to use enough of the other stuff to fit with the amount of green beans, but it’s still a little light today on green beans. No matter – it will be delicious for a hot afternoon on the water. The stelvio cheese (a northern Italian creamy cheese – a cousin to Swiss) I purchased at one of my favorite stores in the Strip District of Pittsburgh. I love the Pennsylvania Macaroni Company and their knowledgeable staff. I’ll write about the Strip one of these days, but for today let me get back on task! Mix together all the vegetables and add salt and pepper to taste. I also added dried dill and dried tarragon. Again, the herbs are your choice. I used about a tablespoon of basalmic vinegar and enough to olive oil to make it glisten – probably twice as much as the vinegar. It’s chilling in the refrigerator right now. This is even better the next day, if you can wait. Enjoy. And let me know if you have any suggestions. 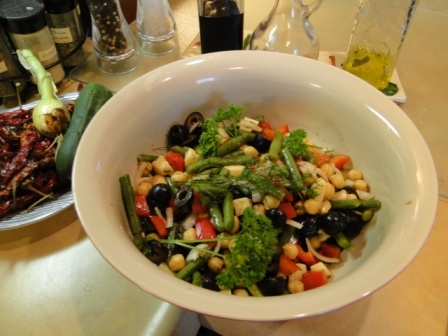 This salad can be made any which way by substituting ingredients to taste. As I’m writing this, I’ve decided to add chopped zucchini to help make up for having less green beans. This time of year, it’s all good! 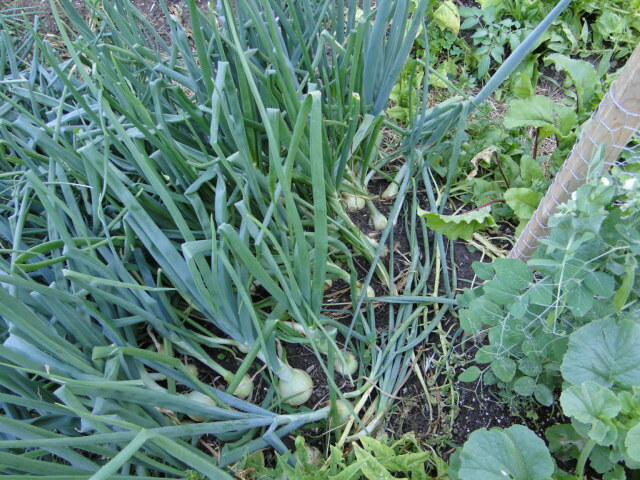 The garden is really growing fast now despite our lack of rain. But nature provides and right after I came back inside to post these photos the rain started – our first in two weeks. It gently laps at my window pane as I type. Last night, we grilled zucchini, small onions and potatoes and steamed green beans. Everything but the potatoes came from the garden, but my husband assures me we’ll be rolling in spuds very soon. He brought in some yellow squash too but I didn’t have room for that on the grill so we’ll have that tonight. He also brought in two more zucchinis so I better get the zucchini relish recipe out and start thinking about putting up some jars of that. I’ll post the recipe and process when I do. 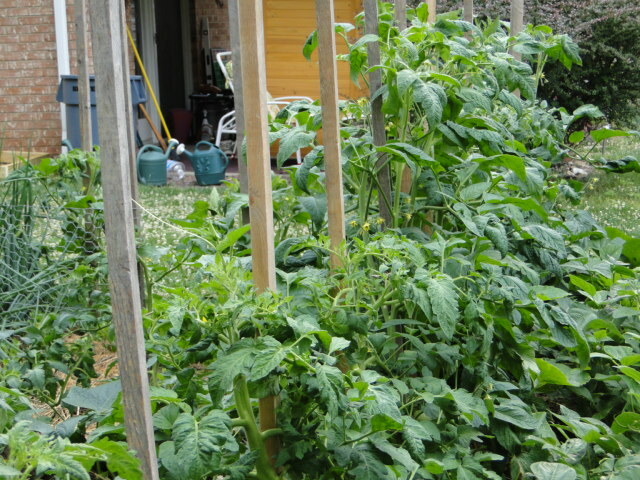 The tomato plants are outrageously big and green. 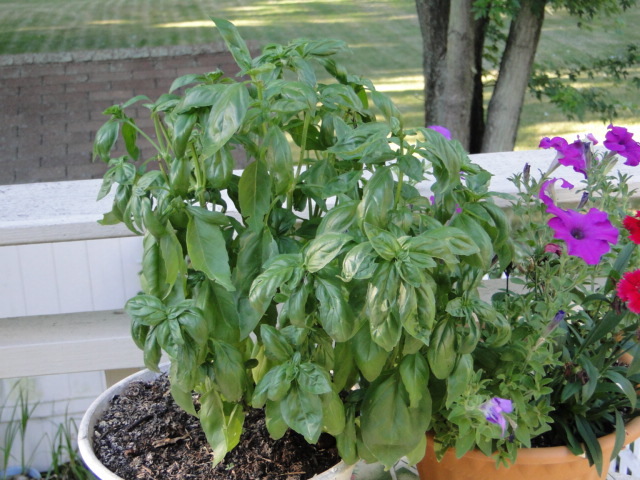 I’m resting a bit right now because within a month I’ll be up to my bangs in toms ripening on the windowsill and waiting to be plopped into my boiling cauldron of herbs and peppers and onions. Or the best of all – sliced for a fresh tomato sandwich! 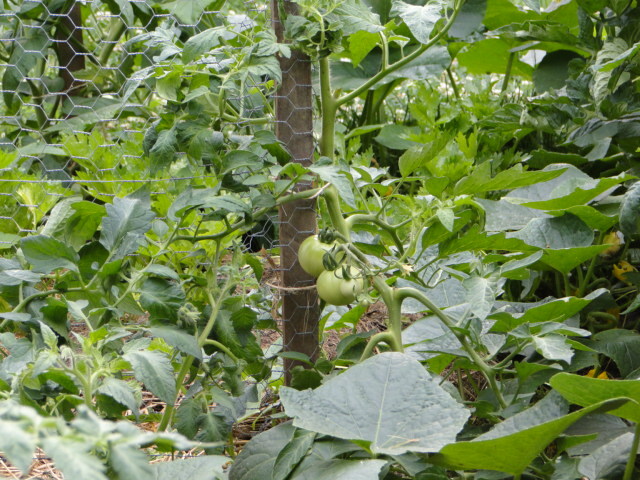 The tallest plants below are a variety called potato tomato – you can tell them apart from the rest by the big leaves that look just like a potato plant. The first tomatoes are beginning the work of turning red on the vine – slowly, but always deliciously. We’re also eating peas – a handful at a time. We just didn’t get the crop that we did last year. 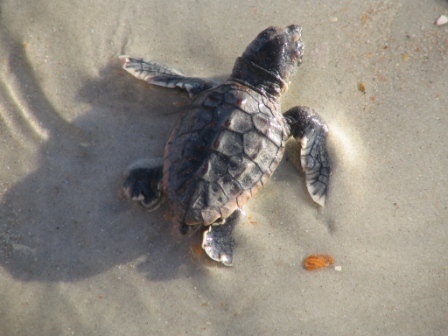 Several years ago, I gave birth on Matanzas Beach, Florida — to a sea turtle. And now that little baby is swimming in the Atlantic having beaten incredible odds so far. If the hatchling survives to adulthood — it takes thirty years for a female to reach maturity — it will have beaten 1,000 to 1 odds for survival. 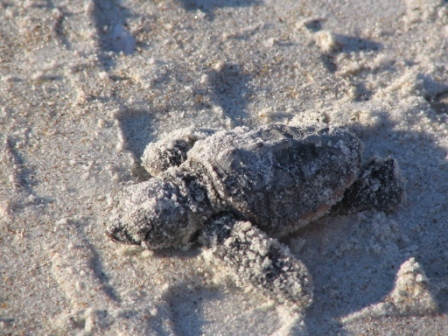 This labor required nothing from me, except to take pictures of this hatchling’s first crawl on the sand. It barely moved at first, and the biologist conducting the dig put it in a box of wet sand until it starting moving around. They continued digging and eventually found the remains of 120 hatched eggs and four eggs that had gone bad. These are pretty good statistics, but there is no guarantee all 120 of the hatchlings made it to the sea. Those of us gathered on the beach kept all predators away from this lone straggler, but the hatchlings didn’t have that protection when they emerged, mostly likely the night before. 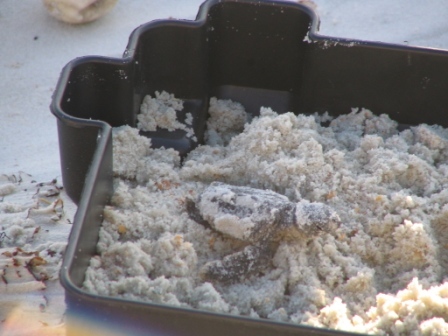 When the hatchling began moving around in the box, a volunteer placed it on the sand next to the nest so it might remember the precise location of emergence. If this one turns out to be a female, in approximately thirty years this same turtle most likely will come ashore at Matanzas and lay its first batch of eggs. The scientists believe the turtles tap into the Earth’s magnetic field while in the nest. Volunteering as a sea turtle patroller requires walking the beach before 7 a.m. By the end of the summer, many of the volunteers have decided it is too much. 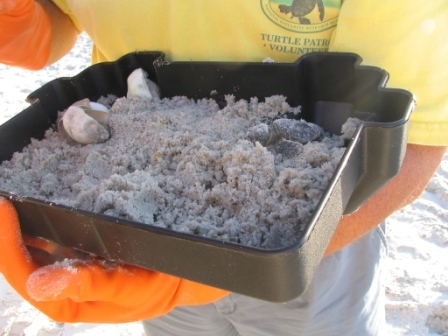 The staff who run the sea turtle program call those of us make it through the entire season the “dedicated ones.” I always thought the end of the season, when the hatchlings emerged, was the payment for the dawn walks on the beach once a week during the summer. 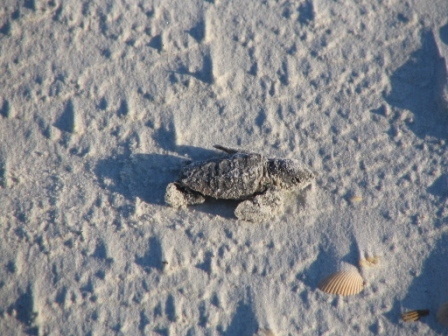 One morning in June, approximately seventy days before the hatchlings in this nest emerged, I walked alone on the beach near the Matanzas Inlet. My patrol partner walked the north end of the beach near Crescent Beach, just south of St. Augustine. We carried our cell phones to call in reports and a stick to mark potential nests. 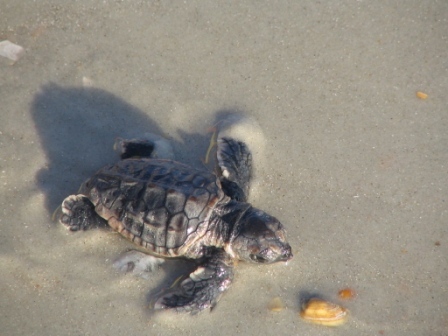 That particular morning in June, I noticed a pattern of swishes in the sand, starting at the tide line and heading toward the dunes, but the patterns looked small for the flippers of the loggerhead, which can weigh up to 275 pounds. I walked away without leaving my stick, but as I continued my patrol, I knew nothing could have left marks in the sand in such symmetry. 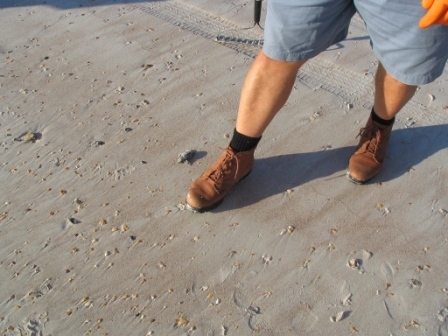 I called the office, reported its location and placed my stick in the sand so the biologists would be able to find it. Later it became a confirmed nest. Matanzas North Nest #3 may have been the official title, but from that day forward, I thought possessively of it as mine. 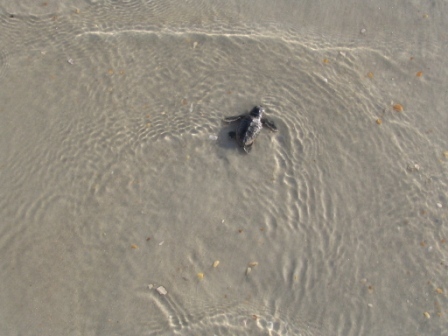 My baby sea turtle began its long walk to the sea following its instincts. A group of high school biology students formed a protective circle with the volunteers. Morning visitors to the beach, along with their vehicles, already competed for space. We left our baby a wide berth that no one could penetrate. As the tide receded, the hatchling encountered some difficulty when the first wave hit it, but it knew just what to do — it just didn’t have the strength yet to swim out far enough not to be swept back in. Repeatedly, we watched as it attempted to go back into the ocean. We cheered each time it managed a ride and commiserated each time we saw it come back toward us. “Watch your feet,” one of the biologists yelled when the wave swept the hatchling back toward those of us forming its shield. Barely two-inches long, this baby looked no bigger than the sack of eggs left by sharks on the beach. The hatchling tried again, this time managing a five-foot entry into the sea, only to be swept back onto the beach again. “This just isn’t fair,” one of the students said. And then a big wave came as we cheered, but my baby came back near my own feet — belly up. The soft under belly, black and white spotted, faced me as its flippers frantically tried to right itself. One of the biologists picked it up, walked out into the ocean for over ten feet, and let the sea turtle go into its world undersea. In one hour this baby had been pulled from the sand, crawled for the first time and then swam away to fend for itself in the sea. We had done all we could to protect it.